Constipation – You will be surprised if I say, there is no problem called “constipation”. What is constipation ? If you are not passing stools properly on time, you get a feeling that you have constipation problem. Everyone of us think that when you wake up in the morning, it should go. If it doesn’t go in the morning when you want to go, and when it doesn’t go, you call it as “constipation” problem. I will tell you a very simple technique. Just follow this. When it comes, you go. That’s it. There ends the problem. What we all try to do is when it wants to come, you don’t go instead you go there and wait for it to go. It won’t go when you want. You should go when it comes. Is the understanding clear ? For some people, if you don’t go for 2-3 days or inspite of your pushing when it doesn’t go, you think you have a constipation problem and rush to a doctor to inform who will prescribe a few medicines after lab tests and thereafter if you go, you will start thanking the doctor who prescribed you the medicines. “Constipation” is giving you an indication that the food you ate the previous night has not digested properly. The biggest problem in India next to Poverty or almost close to Poverty is there is no “Toilet” to go. When you want to pass urine, there is no toilet to go. So what you do, you hold on and wait till you get a toilet near by and then pass. Same is the case with stools. How many of us have undergone this problem ? If there are 100 people in a room and ask them a question, whether they have not faced a problem of not being able to pass stools when it comes, no one in the room will say “No”. Every single person in the room will admit the fact that they have faced such situations. Because in India, there is no proper “Toilet facility”. Since you hold on and then go, health problems arise. Men atleast can manage somehow. Imagine the condition of women. You know something ? When women step out of the house in the morning, they pray at home that till 8 pm in the night when they return home, they should not get urine to be passed outside. Infact they refrain from drinking water in view of their fear that they will have to pass urine after sometime. Women, therefore, faces huge health problems compared to men. Please sit alone and start reading these lines what I am writing. Does it make sense ? Do you agree that women are the ones who are facing lot of health problems compared to men ? Why is that so ? It’s because, women do not go when it comes. They have the habit of controlling and going only when they come back home. If you stop going when you want to go, and instead go when it comes, your so called “constipation” problem will no longer be there in your mind. When it comes, you should go immediately wherever you are. You shouldn’t hold it beyond 5 minutes. When you are hungry, you should eat within the next 5 minutes. When you are thirsty, you should drink water within the next 5 minutes. When you are feeling sleepy, you should sleep within the next 5 minutes. Ask yourself a question, other than the last point, are we following the rest as mentioned above ? Please note no one in has a problem called “constipation”. It’s there in your mind. However, in the larger interest of people who will not accept what I am saying, I give below some remedies. Have 5-7 slices of Papaya fruit for 21 days. Your constipation problem will vanish for ever. Word of caution. This is not recommended for Pregnant women. Ridge Gourd Vegetable is a super immune system booster for a human body and is one of most effective means to get relief from constipation, Piles and many other body ailments. Eat Ridge Gourd twice or thrice a week to get rid of constipation and piles ailments. Stop eating food which is prepared in the morning or yesterday. Eat the food freshly cooked in the night and have it hot. In view of the fast life we are all leading, we cook food only once in a day, that is, in the morning, and in some locations, I understand that for a week food is prepared and kept in the fridge. They just heat the same in the night and have it. Is it a good practice ? If you don’t change this, you will continue to have health problems and your constipation problem will be eternal. As far as possible, take light food in the night. For all those who feel they have “constipation”, I would advise them to have Boiled Rice Porridge (Kanji). For a change once in a while you can have Ragi Kanji, Liquid Rava Upma and so on. Do not give your teeth any work in the night. Have food which are very light. If your morning routine should be normal, your body should be hot during the night. If the night food is hot then your morning stools can be passed smoothly. Let’s say, you have your dinner around 7 pm (approx. time) in the night and you hit the bed around 10 pm. During this period, whenever you feel like drinking water, consume only luke warm water. Do not drink plain water. Avoid fridge water. If you have 2-3 times between 7 to 10 pm, all the 2-3 times, drink only warm water. Go for a 10 minutes night walk after dinner. When you do this religiously, your constipation problem will no longer be there. Do this for 21 days and see the results. Have one Yelakki Banana in the night just before going to bed and before drinking water. Give 15 minutes gap and then before hitting the bed, in warm water, mix lemon juice and drink it. Inspite of doing all the above, if you are still unable to pass stools in the morning, do this exercise. Drink 1 litre water and soon after that draw 8 eight times similar to Cat Walk in a Fashion Show inside your house and in front of your wash room. While you are walking 8, you will get the result. The day you see your stools going out as a “paste” from your body, you can be rest assured that you are absolutely free from all health problems. 8 out of 10 people pass hard stools in the morning. Thick and hard stools when passed is an indication that you are suffering from some health problem or the other. Your food intake the previous day has not been digested properly. Piles comes to people who is facing abnormal body temperature. What does this mean ? The normal body temperature is 98.6 deg farenheit. Right ? If it is above 98.6 deg farenheit and if people have Piles problem, it should be treated differently. If it is below 98.6 deg farenheit for them it should be treated differently. You may ask a question. Can the body temperature be lesser than the normal temperature ? Yes it will be for people who don’t work. People who are sitting in the Cash box, sitting before the PC and Laptops, Managers of Showroom, Offices, etc. and who do not give work to their body – their temperature will be low. Masons, labourers, skilled workers like Salon Service Providers, Restaurant waiters, who give excessive work to their body – their temperature will be high. I have given these two as examples. You need to understand which category of person you belong to and treat your body accordingly. If you keep your temperature normal, piles problem will run away. For that you should first define yourself which category you belong to and do the following every day. In a month’s time, your piles problem will be resolved. For people who need to increase their body temperature – Every morning, walk for 45 minutes in a Park. Eat Drumstick. For people who need to decrease their body temperature – Eat Pumpkin, Cucumber and drink tender coconut every day. In 30 days time, your piles problem will vanish. There are also other simple home remedies. Radish Juice – Every day for a period of 7 days, drink Radish Juice extracted after blending the radish in a mixi. For sweetness if you wish, you can add honey or jaggery but do not add white sugar. If you can eat and chew radish every morning and evening without grating it, in seven days, your piles disease will vanish. If piles is very severe, it may take 30 days. Cow ghee and Radish Juice – In a bowl pour two table spoons of cow ghee and four spoons of radish juice, stir it well and drink it instantly. Have it twice a day, once in the morning and once in the evening. Some people may get nauseated but don’t worry, it detoxifies your system, it improves your liver function, it evacuates the wastage and cures piles. Marijuana Leaves – This is not for consumption. Take few leaves and grind it to paste. Take a cotton wool and put this paste on the cotton and stick it at the piles area. It will shrink the piles tag and will help you in the cure. Use this method at night before going to bed. Let the paste remain in the area for about half an hour and wash it with luke warm water. Do this for 7-10 days and you will get amazing results. 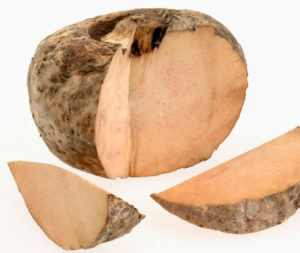 Cust small portion of this Yam into pieces and blend it to make it a paste. Mix it with small bowl of yoghurt and drink it morning and evening. It is a very good remedy for Piles. If you have pain and are unable to sit properly, have this for 7-10 days and you will get a lot of relief. In one glass of plain cold milk, add one spoon of lemon juice and have it instantly without waiting or stirring. It is very effective. Have this twice a day for 3 days. If you have a bath tub at home, then fill the bath tub with luke warm water or create an artificial bath tub which is good enough for you to sit inside the tub. Add 4 spoons of coconut oil and 4 spoons of mustard oil and adequate neem paste and mix it with the luke warm water and just inside the tub. The ingredients put inside this water will start working at the piles area and will give you relief. Coconut has fibres in it. Remove the fibres and burn it. The ashes you get out of it should be mixed with butter milk and have this twice a day. It will give you great relief. Butter milk should be regularly consumed by you to get relief from Piles.